Can't decide if you're overweight or not? You can turn to your scale, your waistline or your doctor to help you figure it out. The one thing you shouldn't do, however, is trust your lyin' eyes  at least if the people around you have weight woes of their own. One of the toughest things about battling obesity is that the aesthetics of weight can be so slippery. Modern swimsuit models are skinny by 1950 standards; Marilyn Monroe might seem plump next to women today. Few things shape our perceptions more than the appearance of friends and family members  and few people are influenced by that more than children. In a Canadian study released last month, a team of investigators surveyed 3,665 children in the 9-, 13- and 16-year-old age groups. After measuring each child's body mass index (BMI)  a figure computed on the basis of height and weight  they found that 14% of the subjects were overweight and 9% were obese. But when the kids were asked to select from a series of silhouettes the shape that most resembled theirs, the great majority of overweight subjects chose bodies thinner than theirs. "As more of the population becomes overweight, perceptions and social norms shift," says Katerina Maximova, lead author of the study and a Ph.D. candidate in biostatistics at McGill University in Montreal. "If you're a little child and your parents are overweight and so are your peers, nothing else will make as big an impact." 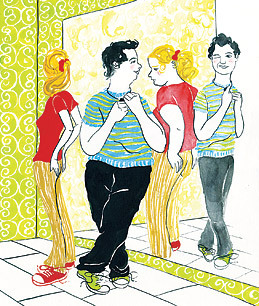 Just as troubling: while some people underperceive fat, others overperceive it. Spend enough time in a media environment in which tanned and toned models seem to be everywhere, and you can't help feeling at least a little lousy about your body. In extreme cases, this can lead to obsessive dieting or life-threatening eating disorders. One healthy response to all this push-pull between thin and fat has been programs that promote body-acceptance  the idea of loving yourself as you are. While that's vital to developing self-esteem, it can also backfire. "Paradoxically," says Maximova, "people may just wind up accepting that they're overweight, making them less inclined to get healthier." If you are committed to losing weight, the first step might be to find an objective arbiter who can help you determine what your goal should be. Let your physician work out a healthy body weight for you. Then let your scale  not your self-perceptions  tell you if you're staying close to it. Blood pressure, cholesterol, cardiac function and blood sugar are also reliable metrics of how your weight and lifestyle are influencing your health. Even if the numbers on the scale are pretty good, creeping diabetes or hypertension is a clear sign that something's off in your diet or exercise regimen. Most important, if you're a parent struggling with weight and you see your kids fighting the same fight, remember that just as children can be influenced by how their parents look, they can also be shaped by how their parents act. When you eat better and exercise more, the most impressionable members of your family may fall in line behind you.